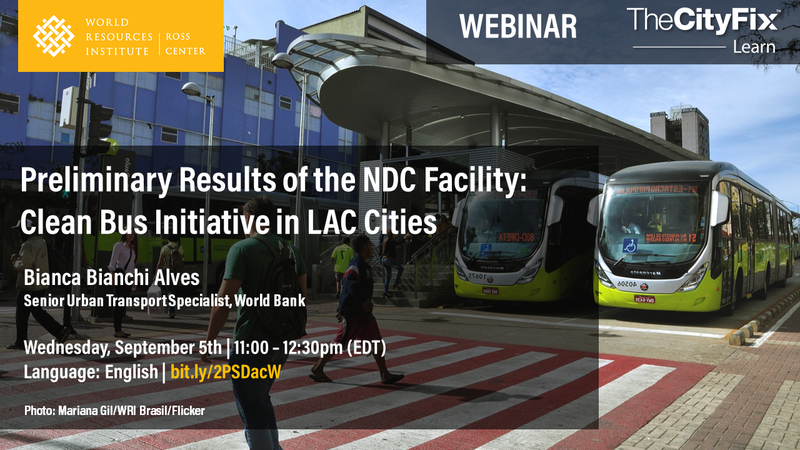 This seminar, led by Bianca Bianchi Alves of the World Bank, will be on the Clean Bus Project. This initiative, implemented by the World Bank and financed by the NDC Partnership, is a diagnostic of the drivers and barriers of adoption of cleaner technologies for public transport in five cities in Latin America (Buenos Aires, Argentina; Mexico City, Mexico; Montevideo, Uruguay; Santiago, Chile; and São Paulo, Brazil). These cities were selected as representative of a range of sizes, demographics, public transport systems and governance structures in the region. The presentation summarizes the findings under five factors that constitute the enabling environment for the introduction of clean buses in each city: 1) public transport system, 2) environmental policy, 3) energy sector, 4) governance and markets, and 5.) E-funding and finance. Register here.